Oh Great Pumpkin, where are you? Halloween is my favoritest holiday! What could be better than candy and costumes (not to mention, orange-colored white chocolate Kit-Kats!). 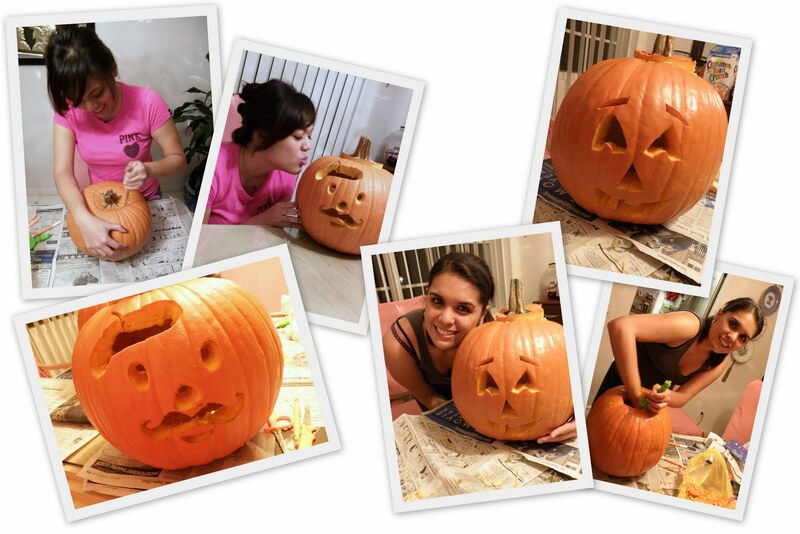 Although my actual Halloween was pretty low-key (lunch with Mom and the sister in the pumpkin skirts I made, shopping at the mall, taking care of Etsy/blog stuff), my sister and I made sure to make the most of the holiday and celebrate by carving pumpkins the week before. We headed over to Nancy's Ranch to pick pumpkins (and it was really hard to choose!). We found the perfect ones--large, round and very orange, and hauled them home along with pumpkin-carving kits and artificial tea lights. I decided to go for a French guy with a beret and mustache, and since it was Tritia's first time carving a pumpkin, she did a cute traditional Jack-o-lantern face. Someone mentioned that Pierre looks a little like the Pringles guy, haha! I think he kind of looks like the Monopoly guy. Maybe both? You decide. Hope you had an amazing Halloween (or if you don't celebrate, hope you had an amazing weekend either way).